This delightful Edinburgh self-catering apartment is situated in a Georgian-style circus development off Morrison Street in the heart of Edinburgh's prospering west end, directly adjacent to "The Exchange" financial district. 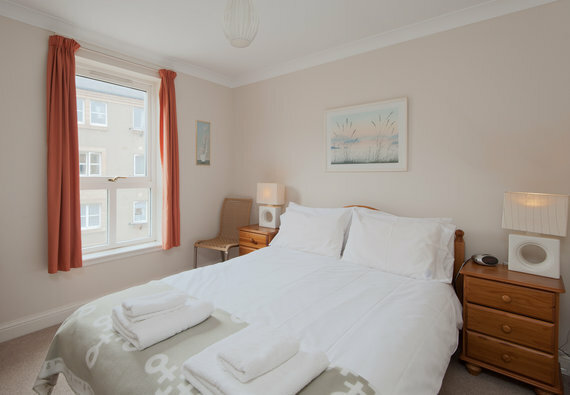 Quiet but central, this beautifully appointed short stay accommodation sleeps 4 people and is conveniently equipped with private city centre parking. The bright lounge overlooks the gardens and there is a well equipped kitchen with dining area, one double and one twin bedroom and bathroom. Morrison Street and neighbouring Dalry Road have convenient local food shops, newsagents, a chemist and some excellent restaurants, just minutes from the property. Those looking for business travel accommodation while working in Edinburgh will find our Alba Morrison apartment ideally placed. The property is directly adjacent to Morrison Street, which lies at the epicentre of Edinburgh's central Financial District. A Broadband Internet connection is available and Telewest cable TV is also installed. Princes Street, the Royal Mile and George Street shops are within walking distance or short taxi ride, as is Edinburgh Castle. A short bus ride takes you to Edinburgh Zoo, HMS Britannia, the Botanic Gardens, Holyrood Palace and park and many other venues. As such, the apartment makes for an ideal short term flat to rent as Edinburgh Festival accommodation. For rugby enthusiasts, the flat is conveniently situated for Murrayfield Stadium. We are 10-15 minutes from major arterial routes (M8, M9 and Edinburgh City Bypass). * 1 twin and 1 double bedroom. * Bathroom with electric shower over bath. Electric razor point. * Cot & High Chair available. Sleeping arrangements Double bed in one bedroom 2 singles in twin bedroom. Local area Morrison Street and neighbouring Dalry Road have convenient local food shops, newsagents, a chemist and some excellent restaurants, just minutes from the property. Princes Street, the Royal Mile and George Street shops are within walking distance or short taxi ride, as is Edinburgh Castle. A short bus ride takes you to Edinburgh Zoo, HMS Britannia, the Botanic Gardens, Holyrood Palace and park and many other venues. As such, the apartment makes for an ideal short term flat to rent as Edinburgh Festival accommodation. For rugby enthusiasts, the flat is conveniently situated for Murrayfield Stadium. El apartamento grande y limpio. Con accesorios en cocina,lavavajillas,lavadora,secador,toallas y sábanas. Muy buena atención por parte de David que nos esperó hasta que llegamos y contestó todas nuestras consultas sin ningún inconveniente. Cocina y aseo bien equipados. Thank you for taking the time of post your feedback. I am glad to hear you were happy with the location of the property. We are not aware of any structural issues in the property, and this development is not very old, however, I have passed your comments onto the property owner to investigate. We require a £200 refundable security deposit from all our guests, in all our properties. This is noted in our terms and conditions which can be seen prior to booking. The apartment was lovely, very quaint. We were met at The Alba Morrison Residence by David who was lovely very helpful. We had a parking spot reserved for our car which was a bonus.The apartment was in a very convient area close to town.